There’s not much I can think of that geeks love more than chocolate! What’s not to love? It’s delicious, chock-full of calories and sugar, and caffeinated (for those late night Xbox Live parties or D&D sessions). Studies have shown that chocolate is even beneficial for your health by giving you antioxidants to fight off free radicals and lowering blood pressure—though the benefits are from the cocoa powder itself, as opposed to all the sugar and fat added, but who’s counting?! For my birthday, my friends got together and made me a cake designed after the one at the end of the game Portal—a three layer chocolate cake complete with whipped cream and berries on top. It was so rich, however, that it was difficult for three people to finish eating before it started going bad. So for portion control, we opted to make cupcakes this time! But look at me still talking when there’s baking to do! I demonstrate proper smooshing technique for maximum chocolate chipness. Preheat oven and prepare cake batter as instructed on the box. Put the bags of chocolate chips and M&Ms in the fridge, as the kitchen may get warm and cause them to melt. We wouldn’t want that, now would we? Fill the cups about 2/3 full of cupcake batter. Bake approximately 20 minutes, or until a toothpick inserted into the center of the cupcake comes out clean. Frost cupcakes with a moderate amount of icing. Pour a small amount of the chocolate chips onto a saucer so that they form a single layer. Take the cupcakes one by one and place icing first onto the layer of chocolate chips. Give a gentle push on the bottom, to ensure maximum chocolate chip coverage. 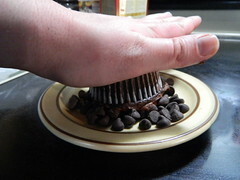 Lift cupcake and tamp down the chocolate chips, filling any gaps by hand. Place cupcakes in the fridge for about 5 minutes, to allow icing to stiffen. Using a fine tipped decorating bag (or the icing that comes with several shaped tips), gently squeeze 8 small dots of white icing along the circumference of the cupcake. Top with red mini-M&Ms. Add a candle and invite your friend, the companion cube, to the party. Please be advised that a noticeable taste of blood is not part of the cupcake’s ingredients, but is an unintended side effect of the cupcake’s ingredients which may—in semi-rare cases—emancipate crowns, dental fillings, tooth enamel, and teeth.